Premier Ltd. (formerly The Premier Automobiles Limited) is a manufacturer of vehicles based in Mumbai, India. The company is owned by the Walchand Group. Walchand established Premier Ltd. with the encouragement and support of architect of modern India, Sir. M. Vishweswarayya. In October 1947 Premier Ltd. manufactured the first Indian made trucks and cars rolled out onto the streets of a free India. 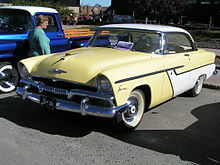 The company was established in 1941 and negotiated with Chrysler Corporation for licenses to build a Plymouth car and a Dodge truck, sold under the Dodge, Plymouth, DeSoto, and Fargo names starting around 1949. In the early years, quality was considered good by both Chrysler and the Indian Department of Defense. In 1949, parts were being made in India, starting with simpler components and gradually building up to more complex pieces. Two companies made parts for these vehicles: Premier and Hindustan Motors of Calcutta. The early years of Premier and Hindustan were marked by very low sales, due to the size of the market; only about 20,000 vehicles per year were made in India, in 65 different models. To prevent foreign companies from dominating by mass-producing parts to be assembled into cars in India, the government set up steep import duties on imported parts in 1954, allowing Indian parts-makers to survive. Premier licensed and manufactured a version of the Fiat 1100 D (beginning in 1964 continuing almost unchanged into the late 1990s). The car was initially marketed as a Fiat ("1100 Delight") and subsequently as the Premier Padmini with a 40 hp (30 kW) 1100 cc engine and manufactured at the now defunct Kurla factory in suburban Mumbai. Later models included the Premier 118NE (named after its 1171 cc Nissan A12 engine and with a transmission from the Nissan Cherry), a version of the 1960s Fiat 124 built in a then-new (but now defunct) factory at Kalyan. The 118NE was considered a mid-size luxury car in India until the influx of modern cars in the 1990s. With market liberalisation, Premier teamed up with Peugeot to build an outdated model of the popular Peugeot 309 in India. Initial demand was high but labour problems and poor dealer service led to problems which were compounded when Premier also aligned with Fiat to manufacture the Fiat Uno. Peugeot pulled out of the venture around 2001 after only a few thousand cars sold. Labour and service issues also plagued the Fiat venture and a strike finally caused the plant to shut around 2001. Fiat and Premier faced severe criticism in media. There were various criminal cases against its promoters and the consumer courts of India were flooded with complaints for non-refund of the car booking. The promoters of Premier Automobiles have also been confronted with criminal cases in various consumer courts of India under section 27 of the Consumer Protection Act. A customer association based at Gujarat - Rajkot called Pal Car Customer Association – has made various representations against the Premier Automobiles Ltd. In November 2004, Premier restarted operations by building a small diesel powered van called the Sigma. It was based on a 1980s Mitsubishi Varica design licensed from China Motor in Taiwan, originally intended to be fitted with Peugeot's TUD5 diesel engine. The production version, as finally presented in late 2004, instead had a Hindustan-built 2-liter Isuzu diesel unit. It has 58 hp (43 kW) and is mated to a four-speed manual gearbox, while the car offers from five to nine seats. A multitude of other versions have since been developed, and as of December 2009 the engine has been replaced by a 1.5 liter IDI diesel (with or without turbo) or by the CNG-powered 1.8-liter 4ZB1 (both still manufactured by Hindustan). The facelift also meant improved suspension. There was also a pickup version of the Sigma, called the Premier Roadstar. Today, Premier has two business segments: Engineering and Automotive. The Engineering segment has two activities - CNC Machine Division and Engineering while the Automotive segment consists of Light Utility Vehicles and Sports Utility Vehicles. Originally based in Mumbai, Premier is now located at an ISO 9001 certified plant in Chinchwad, Pune. Spread over 27 acres, this plant now serves as the centralized research, development and manufacturing for all activities. ^ a b "Premier Contact US". Premier.co.in. Archived from the original on 2010-08-21. Retrieved 2010-08-12. ^ Annual Report[permanent dead link], Premier Ltd.
^ "Premier Ltd". Premier.co.in. Retrieved 2011-01-01. ^ IHP. "The Indian Hume Pipe - Manufacturer of Reinforced Concrete Cement Pipes, Non-Cylinder Prestressed Concrete Pipe". www.indianhumepipe.com. Retrieved 2017-02-07. ^ a b Sealey, Mike. "Chrysler cars of India - Premier Automobiles". Allpar.com. Retrieved 2011-01-01. ^ "Premier Sigma". Archived from the original on 2009-12-05. ^ Krishnan, Srinivas (2004-11-20). "Premier Sigma - Van Diesel". Business Standard Motoring. Retrieved 2013-09-21. ^ a b "Premier's Sigma, Roadstar, Rio to hit the road in December". The Hindu Business Line. 2009-11-25. Archived from the original on 2013-09-21. ^ Mazur, Eligiusz, ed. (2006). World of Cars 2006·2007. Warsaw, Poland: Media Connection Sp. z o.o. p. 153. ISSN 1734-2945. ^ "About Us". Premier Ltd. Archived from the original on 6 June 2012. Retrieved 14 December 2012. ^ "Premier RiO". Premier RiO. Retrieved 2011-01-01.